All the senior AGP members carried shankha with them during the course of the rally to show their opposition against the Citizenship Bill. AGP President and Assam cabinet minister Atul Bora, former Chief Minister Prafulla Mahanta, cabinet ministers Keshab Mahanta & Phani Bhusan Choudhury, senior party leaders Biren Baishya, Hiranya Konwar, Kamala Kalita and all the AGP MLAs were present in the rally. In recent weeks, Assam has seen many protests over the proposed Citizenship (Amendment) Bill, 2016. 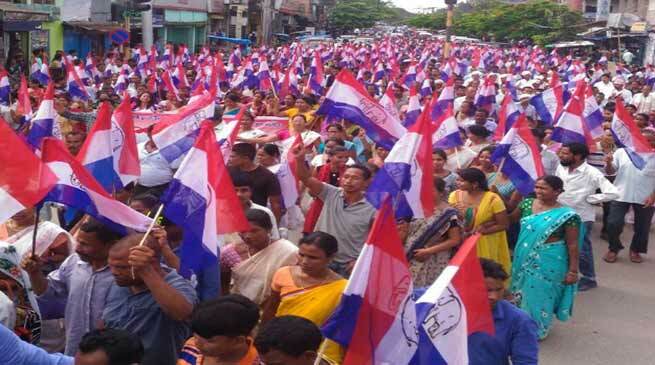 The Bill has been termed “Anti-Assam” by BJP’s ally Asom Gana Parishad, and similarly criticised by other regional parties. And, in the last month, “when the Joint Parliamentary Committee on the Bill visited Assam and Meghalaya to hear from the locals, it did so amid protest voices which said the move would make Assam a “dumping ground for Hindu Bangladeshis”. With The Citizenship (Amendment) Bill, 2016, the government plans to change the definition of illegal migrants. The Bill, introduced in the Lok Sabha on July 15, 2016, seeks to amend the Citizenship Act, 1955 to provide citizenship to illegal migrants, from Afghanistan, Bangladesh and Pakistan, who are of Hindu, Sikh, Buddhist, Jain, Parsi or Christian extraction. The Bill also seeks to reduce the requirement of 11 years of continuous stay in the country to six years to obtain citizenship by naturalisation.